Home FAQs Are plasmids recovered using the Monarch Plasmid Miniprep Kit endotoxin free? FAQ: Are plasmids recovered using the Monarch Plasmid Miniprep Kit endotoxin free? Although Plasmid Wash Buffer 1 does remove a large majority of endotoxin from the sample, the DNA recovered cannot be guaranteed to be completely free of endotoxin. That being said, we have successfully used plasmid DNA recovered using our kits to transfect robust cell lines (see data below). While other vendors may claim their minipreps kit to be “endotoxin free”, there is usually still some measurable endotoxin. 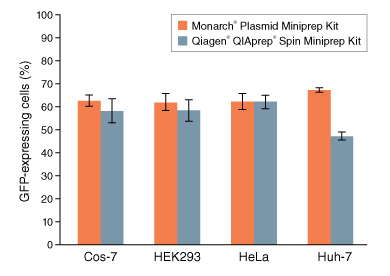 Plasmid DNA encoding constitutively expressed GFP (pEGFP-C2) was prepared using either Monarch Plasmid Miniprep Kit or Qiagen QIAprep Spin Miniprep Kit. Four different cell lines (Cos-7, HEK293, HeLa, and Huh-7) were grown to 80-90% confluence and transfected with 100 ng of each plasmid, in complex with 0.3 μl Lipofectamine 2000, and 10 μl Opti-MEM. Five replicates for each cell type were performed using both DNA preps. GFP expressing cells were counted by flow cytometry 48 hrs post-transfection with a minimum of 2000 events collected per well. Average percentage of cells expressing GFP from all replicates is graphed and used as a measure of transfection efficiency.